Fire hydrant and charged riser systems provide a means to deliver water to the Fire Service on large sites and within buildings to permit manual fire fighting and rescue activities. ingross technologies experienced team are able to assist you with the engineering, design, installation, maintenance and testing of fire hydrant and charged riser systems. Fire hydrant and charged riser systems within buildings should be designed, installed, maintainedand tested in accordance with the requirements of IS code of - Fire Hydrant Systems For Buildings. Site fire hydrant systems should be designed, installed, maintained and tested in accordance with the requirements of IS code of - Fire Hydrant Systems For Buildings. There are a number of different terms that have been used to describe different types of risers within buildings, these are explained below. A vertical pipe installed in a building for fire fighting purposes, fitted with inlet connections at fire brigade access level and landing valves at specified points. The pipe is normally dry and is charged with water by pumping from Fire Service appliances. A vertical pipe installed in a building for fire fighting purposes and permanently charged with water from a pressurized supply sufficient for fire fighting, and fitted with landing valves at specified points. A hydrant main installed in a building for fire fighting purposes, fitted with inlet connections at fire brigade access level and outlet assemblies at specified points. The riser is normally pressurised with water for monitoring purposes via a small diameter pipe connection. Water for fire fighting purposes is provided by pumping water into the inlet from the fire service appliances. This is a product is telling about safety. By the chemical composition it is opposing fire in large gatherings like the offices, working organizations, shopping malls, cinema theaters, bus stands, railway stations or any other public gatherings to solve any unwanted fire problem. Two prime types of fire extinguishers are stored pressure and cartridge operated ones. 0.5 kg to 25 kg weight range. 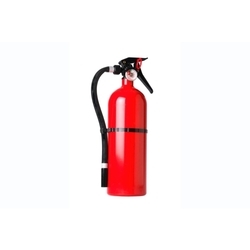 In general foam based, water based, CO2 based, halon based, dry chemical and wet chemical based extinguishers are available. The outlook is generally of red color in all the types.